WILD HEARTS CAN'T BE BROKEN is about diving horses. In the movie, a girl visiting a fair spots a sign for "diving horses." After watching a red mare and her rider dive off a high platform into a deep pool of water, the thrilled girl applies for the job of riding the horses. At first, the old manager refuses, but he finally accepts her for a job taking care of the horses and eventually diving with them. The girl cares for the fractious mare, avoids the haughty and dramatic lady, and fervently trains with the beautiful new stallion, Lightning. Soon, the previous rider is fired because of financial demands, and the girl is promoted to diver. However, when Lightning injures his leg, she is forced to use the nervous mare. She consents to dive with her, but the too-fast dive leaves her blind, and the old diver is re-hired. Will the girl ever get to dive on her grey Lightning again? Find out in WILD HEARTS CAN'T BE BROKEN! PS. This movie isn't a new one. I'm not sure when it was made, but it is still REALLY GOOD! I have it on iTunes but I do not know where else you can get it. 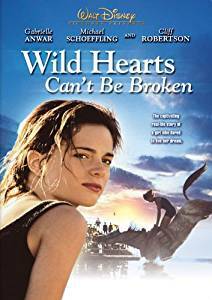 Wild Hearts Can't Be Broken is Awesome! I love it, every horse girl must see it. HI girls i'm just wondering where can you find WILD HEARTS CAN'T BE BROKEN online for free because i am dying to see it!?!?!?!?! Secretariat is Another horse movie. this was a real sport and it's bad for the horses. they used to use ELECTRIC JOLTS to get the horse to jump. I watched that movie a long time ago, so I don't remember most of it. But I do remember that I liked it a lot. I'd like to see it again. i watched this on youtube and it's breath taking. You got to see this film, specially the last part! this is my absolute fave movie next to black beauty and water for elephants. It's about a girl who has so many hardships but keeps trying to achieve her dream. This movie for me was a tearjerker in some part and had me laughing in other parts. This movie is AMAZING!! I thought this was an awesome movie. The girl is so brave and her horses is so trustworthy. I love this film. Before watching it for the first time i was in a horrible mood as i had some serious problems, But when the film came to it's end I've realized several things. 1. We should be so grateful to people who love us. 2. We should never give up. This film really helped me to get out from a kind of depression. I strongly recommend to watch it. The film is WONDERFUL!!! I think this is a great movie. film is a little sad because the girl became blind. I saw this movie and enjoyed it. If you like horses and want a family horse movie try this one! This is not the world's best horse movie (make way for secretariat!) but it is a wonderful inspiring movie! This 1991 Disney movie was a favorite of mine as a child, and I still love to watch it today. It's realistic, no miracle horse, no sudden bond with a "crazy" horse. She has to work hard to prove herself and Lightning (who is a gelding, not a stallion as stated above). There's a bit of a love story involved and it gives a nice perspective on the Great-Depression Era. The show is sad, I think. This is one of my favorite horse movies!!! I watched it twice and cried both times. This was okay.. I wonder how much the horses enjoyed jumping.. It was sweet but not AMAZING. i love this movie. its the best i will not lie!!! This is the BEST movie ever I almost cried when she gets blind and does the dive! horses are girls best friends!!! wild hearts can't be broken sounds like a really good film/book to read. i hope i read/watch it some time!!! This is a really good movie. Diving horses WAS once common though. This is really a wonderful story, and really, the title says it all! I Love that movie,it's the best! If you haven't seen it you HAVE too! It's REALLY good! to see. If you don't have netflix get a free trail. This is no doubt one of my all time FAVORITE horse movies! It's also based on a true story! my sister owns this movie we both love it so so much! where can buy wild hearts can't be broken? i really like this movie. Once my mom was watching this movie. Then I started watching this. I think that it is a wonderful movie. This movie is about a girl who loves to ride horses, and she learns how to dive with them (like from 100 feet up), but one time when she was diving her horse slips and falls and she goes blind. You'll have to watch the movie to see the ending! It is a very very very very very good movie! cool i saw that movie too! Actually not a bad movie. Not my favorite horse movie because a) I tend to avoid older movies and b) it's a bit over romanticized but its still a good film and definitely worth seeing at least once. On a side bar, can anyone recall the movie where the woman and her kid move and they're basically broke and she's working at a stables for money as well as board for her horse - dressage rider and at the end of the movie she competes at grand prix level with her horse and he's blind? Note from Sydney: Tyra, you are thinking of The Long Shot!